Sandman Overture Issue #2: Delays and Problems? covers mirror the two printed. I don't always enjoy spin-off or continuations on legendary books. Sandman has legendary status in my heart library. I have to admit however that I'm just as please reading Overture as I was when I read the original Sandman stories long ago. The artwork is impressive and imaginative. It has the whimsy that Sandman was always meant to have. J.H. William III, may you never quit this series. 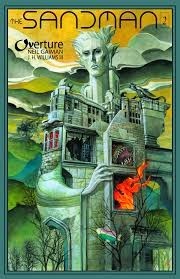 Gaiman of course is his usual self, included prose and riddles to tell his story. In this issue Dream the Eternal finds out why he has been summoned as he bounces ideas off himself, literally as he has been split into fragments of his being (or personality, however you want to look at it). It felt as though this issue took so long to come out and upon reflecting this is true. The series is releasing at an usual pace. Normally I find these lulls due to production delay but in a recent interview with CNN, Gaiman states that the release date for issue 3 is likely July although Vertigo release schedule still quotes April. I won't hold my breath and you shouldn't either. Gaiman can pretty much do as he pleases and if he says July, I'll take it. Although I enjoy having a regularly release book, I get why releases are delayed. With a book like Sandman, I'd rather Gaiman and Williams took their time and continue to nail it. However if you can't wait 3 months for the next issue to come out, then please leave this single on the shelf and wait for the trade paper release. Just be prepared to wait a while for it. Sandman Overture is a 6 part mini-series and it's going to be the better part of a year before we hear the end. I dunno how I feel about the whole female titan plot development; let alone the fact that volume eight reveals the female titans identity as Anna! I know that part of writing a review is being able to accurately describe a subject and your feelings/thoughts/opinions surrounding but I don't know that I have one in this case. I suppose you may ask why bother writing anything but I feel like I might as well carry on with the blurbs. I will say this, I was intrigued by the idea pushed at the end, that the wall was full of titans. It's an interesting concept. The humans are defending themselves from titans WITH titans. But I suppose that does tie in nicely with Eren's whole ability to turn into a titan himself and perhaps affect humanities struggle positively. I was quite shocked at the end. The wall development was the only aspect that made me dive into the next volume. God knows it wasn't the characters. I'm not sure what it is about the series but I still haven't found a character I like. Anna was perhaps the one I was beginning to like but know she's a moot point. Captured and unconscious, encased in some translucent and impenetrable crystal. Yea... there's something else I'm not quite getting. I don't totally enjoy the fact that foreign and explainable materials just kinda well.... materialize (snicker) when the humans turn into titans. I also dislike the human hiding unconsciously in the back of the neck of their titan form. It makes me think of the mechas in evangelion and not magic-super-soldier-colossus-thing that I want the titans to actually be. I don't want them to be a mobile suit, I feel like they need to be magic or higher beings or something. Oh, who am I kidding, their probably just aliens. Or worse! Humans in mobile suits! Damn it, I want them to be magic. I'll just keep reading now.